Not to be confused with Livestock guardian dog. An Australian Kelpie walking across the backs of the sheep. "Heeler" redirects here. It is not to be confused with Healer. A Koolie working with sheep. A 9-week-old Border Collie working ducks. All herding behavior is modified predatory behavior. Through selective breeding, humans have been able to minimize the dog's natural inclination to treat cattle and sheep as prey while simultaneously maintaining the dog's hunting skills, thereby creating an effective herding dog. Dogs can work other animals in a variety of ways. Some breeds, such as the Australian Cattle Dog, typically nip at the heels of animals (for this reason they are called heelers) and the Cardigan Welsh Corgi and the Pembroke Welsh Corgi were historically used in a similar fashion in the cattle droves that moved cattle from Wales to the Smithfield Meat Market in London but are rarely used for herding today. Other breeds, notably the Border Collie, get in front of the animals and use what is called strong eye to stare down the animals; they are known as headers. The headers or fetching dogs keep livestock in a group. They consistently go to the front or head of the animals to turn or stop the animal's movement. The heelers or driving dogs keep pushing the animals forward. Typically, they stay behind the herd. The Australian Kelpie and Australian Koolie use both these methods and also run along the backs of sheep so are said to head, heel, and back. Other types such as the Australian Shepherd, English Shepherd and Welsh Sheepdog are moderate to loose eyed, working more independently. The New Zealand Huntaway uses its loud, deep bark to muster mobs of sheep. Belgian Shepherds, German Shepherd Dogs and Briards are historically tending dogs, who act as a "living fence," guiding large flocks of sheep to graze while preventing them from eating valuable crops and wandering onto roads. Herding instincts and trainability can be measured when introducing a dog to livestock or at noncompetitive herding tests. Individuals exhibiting basic herding instincts can be trained to compete in herding trials. In Australia, New Zealand and the United States herding dogs are known as working dogs irrespective of their breeding. Some herding breeds work well with any kind of animals; others have been bred for generations to work with specific kinds of animals and have developed physical characteristics or styles of working that enhance their ability to handle these animals. Commonly mustered animals include cattle, sheep, goats and reindeer, although it is not unusual for poultry to be handled by dogs. The term "herding dog" is sometimes erroneously used to describe livestock guardian dogs, whose primary function is to guard flocks and herds from predation and theft, and they lack the herding instinct. Although herding dogs may guard flocks their primary purpose is to move them; both herding dogs and livestock guardian dogs may be called "sheep dogs". In general terms when categorizing dog breeds, herding dogs are considered a subcategory of working dogs, but for conformation shows they usually form a separate group. Australia has the world's largest cattle stations and sheep stations and some of the best-known herding dogs, such as the Koolie, Kelpie, Red and Blue Heelers are bred and found there. 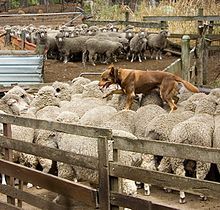 The competitive dog sport in which herding dogs move animals around a field, fences, gates, or enclosures as directed by their handlers is called a sheepdog trial, herding test or stockdog trial depending on the area. Such events are particularly associated with hill farming areas, where sheep range widely on largely unfenced land. These trials are popular in the United Kingdom, Ireland, South Africa, Chile, Canada, the USA, Australia, New Zealand and other farming nations, and have occasionally even become primetime television fare. In the US, regular events are run by the United States Border Collie Handler's Association, Australian Shepherd Club of America, American Kennel Club and many others. A Border Collie at work with hair sheep. Come-bye or just bye - go to the left of the stock, or clockwise around them. Away to me, or just away or 'way - go to the right of the stock, or counterclockwise around them. Stand - stop, although when said gently may also mean just to slow down. Wait, (lie) down or sit - stop. Steady or take time - slow down. Cast - gather the stock into a group. Good working dogs will cast over a large area. Find - search for stock. A good dog will hold the stock until the shepherd arrives. Some will bark when the stock have been located. Get out or get back - move away from the stock. Used when the dog is working too close to the stock, potentially causing the stock stress. Occasionally used as a reprimand. Hold - keep stock where they are. Bark or speak up - bark at stock. Useful when more force is needed, and usually essential for working cattle and sheep. Look back - return for a missed animal. In here - go through a gap in the flock. Used when separating stock. Walk up, walk on or just walk - move in closer to the stock. That'll do - stop working and return to handler. These commands may be indicated by a hand movement, whistle or voice. There are many other commands that are also used when working stock and in general use away from stock. Herding dog commands are generally taught using livestock as the modus operandi. Urban owners without access to livestock are able to teach basic commands through herding games. These are not the only commands used: there are many variations. When whistles are used, each dog usually has a different set of commands to avoid confusion when more than one dog is being worked at one time. Herding dogs are often chosen as family pets. The collie breeds including the Bearded Collie and Border Collie are well known, as are the Welsh Corgis. Although they make good family dogs and show dogs they are at their best when they have a job to do. These dogs have been bred as working dogs and need to be active. They retain their herding instincts and may sometimes nip at people's heels or bump them in an effort to 'herd' their family, and may need to be trained not to do so. Their activity level and intelligence makes them excellent canine athletes. The Shetland Sheepdog, Rough Collie, Smooth Collie and Old English Sheepdog are more popular as family companion dogs. ^ Hartnagle-Taylor, Jeanne Joy. All About Aussies. Alpine Publications. ISBN 1-57779-074-X. ^ a b c d e f g h Hartnagle-Taylor, Jeanne Joy; Taylor, Ty (2010). Stockdog Savvy. Alpine Publications. ISBN 978-1-57779-106-5. ^ United States Border Collie Handler's Association events are referred to as sheepdog trials or cowdog trials. Australian Shepherd Club of America trials are referred to as stockdog trials. Competitions sponsored by the American Kennel Club AKC are known as herding events. This page was last edited 22:11, 31 March 2015 by Wikipedia user Jdforrester (WMF). Based on work by Wikipedia anonymous users imported>Genogenie and imported>Papyrus-winged ninja Akil.